The Ballistic Armored Tactical Transport (BATT) is the ultimate tool for both rural and urban defense on crime. The BATT comes armored in Level NIJ IV/B7 and can stop .50 Caliber rounds. Our Tested and Recommended BATT offers a 6-sided, complete protection package in a very maneuverable and versatile size. The protection package includes a blast mitigating floor, internal armored firewall, rifle rated roof protection, and an aggressive, fully-armored hood clip. In addition to these benefits, our fast and maneuverable BATT, which can accommodate 10-12 geared officers and achieve highway speeds up to 80 miles per hour, also boasts the best in class insulation and climate control system. Our company has always taken pride in listening to our customers and giving them what they want. Front doors can lock out at 90 and 45 degrees to offer extended shielding for officers riding on running boards, offer cover for long gun deployment through Spec Rest System; can enter engagement with doors open for quicker deployment or ability to acquire wounded officer, etc. 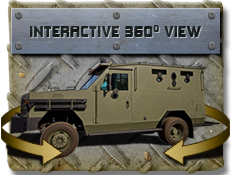 Allows Rear doors to lock out at 90 degrees extending the armor protection on the sill and during deployment and entry; provides protection for officers on rear bumper; offers cover for long gun deployment through Spec Rest system; can enter engagement with doors open for quicker deployment or ability to acquire wounded officer, etc. Copyright 2019 The Armored Car Group, LLC. All Rights Reserved.